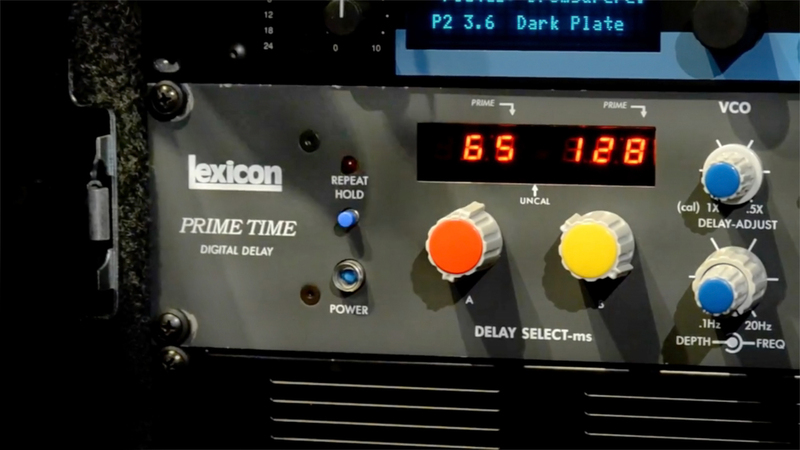 The Lexicon Prime Time Model 93 is a digital delay rack effect unit released in 1978. It is capable of delivering completely unique and singular sounds. The Prime Time 93 is a mono delay line with two inputs and two independent taps. You can invert either signal, mix their levels, and bypass the delay completely with the front panel switches. There are a few special features that really make the Prime Time 93 a secret sonic weapon for people Daniel Lanois. Because of the technological limitations present in 1978, the Prime Time 93 (not to be confused with the subsequent “95” and “97” models) must reduce the bandwidth of any delay longer than 256ms; and that’s with the optional memory expansion installed. Basically, the longer the delay, the more lo-fi the output since you’re cutting out bandwidth. Just to give you an example, a telephone line operates at 3khz bandwidth. The same as when you’re using the 4 x delay multiply. Combine tone mangling delay with an oscillator and infinite repeat and you’re off to the races. “Actually, the Prime Time has both an LFO and a VCO. Internally, the digital circuits are all run by a clock at ultrasonic rates. In the fixed delay mode, the clock is a crystal oscillator. When you click the knob to ‘UnCal’, the clock is taken over by a Voltage-Controlled Oscillator running at similar high speed which you can change with the manual sweep or with the LFO.